Alcohol is consumed in a range of different beverage types. Whilst most people agree a tax on alcohol is a legitimate government intervention, details regarding which beverages should be taxed and by how much vary across countries and has been the focus of much debate. If the rationale is to tax proportionally to any negative consequences that occur as a result of alcohol consumption, alcohol tax should be targeted at those who drive the majority of negative outcomes from alcohol consumption, rather than all consumers. A general alcohol tax would reduce consumption for both groups. An alternative approach is to examine the association of negative outcomes with different alcohol beverage types. A tax policy that taxes the products that are more likely to be associated with negative outcomes or consumed by individuals involved in risky and abusive alcohol related behaviours would be more effective. Alcohol taxation in Australia has long been the centre of debate among health professionals, welfare bodies, grape growers, and beer, wine and spirit producers. 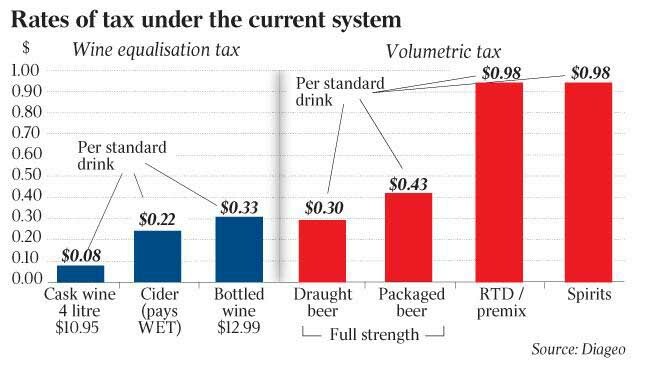 Australia has a complex alcohol tax system where beer and spirits are taxed by differentiated volumetric excise rates according to alcohol strength and wine is levied an ad valorem WET (wine equalisation tax) based on wholesale value. Our study, as opposed to generally treating alcohol as an aggregated product as has been done previously, examines the association of alcohol-related antisocial and unlawful behaviours with 9 specific alcoholic beverage types preferred by individual respondents (regular strength beer, mid-strength beer, low-strength beer, cask wine, bottled wine, fortified wine, pre-mixed spirits in a can, pre-mixed spirits in a bottle and bottled spirits and liqueurs). The data we use in this study are drawn from the latest 2004, 2007, 2010 and 2013 waves of the Australian National Drug Strategy Household Survey, involving 103,304 individuals. In this paper, we focused on the following antisocial and unlawful behaviours while under the influence of alcohol: “Drove a motor vehicle”, “Created a public disturbance or nuisance”, “Caused damage to property”, “Stole money, goods or property”, “Verbally abused someone” and “Physically abused someone”. For practical purposes, we further categorised the activities into two groups: Driving (drove a motor vehicle), Disturbance (created a public disturbance/nuisance; caused damage to property; stole money, goods or property; verbally or physically abused someone). To study the association between alcohol-related antisocial behaviours and consumers’ drinking preferences, a system of probit equations with a triangular endogenous structure was respectively specified to model the two outcome variables. Our results indicate that individuals who mainly drink regular strength beer, pre-mixed spirits in a can and mid-strength beer have the highest likelihood of engaging in binge drinking and individuals who mainly drink regular strength beer, pre-mixed spirits in a can and cask wine have the highest likelihood of engaging in causing public disturbance. By and large, a proposed flat volumetric tax rate for all beverage types is far from the implied existing tax rate and does not seem to be a most efficient policy for taxing based on likelihood of negative outcomes associated with alcohol use. The evidence in this study suggests that the percentage of alcohol in a beverage type is not strictly associated with the change of negative outcomes occurring and thus, the same amount of alcohol appearing in different beverage forms may not generate the same amount of negative outcomes for society.